They say that whatever country the Arabs passed through, they left a part of themselves in its kitchens. Although this references trade routes and voyages of over a thousand years ago, I like to think that this is still true in a more modern sense, like picking up a Middle Eastern cookbook or discovering a certain spice that you then cannot resist using in everything. I think these days it’s taken a bit for granted but much of the foundations of Italian cuisine, particularly southern Italian cuisine, was so heavily influenced by Arabic culture that one food writer, Waverley Root, even said that Arabs “deserved to be classed with the major creators of Italian cooking.” And what an under statement that is when you consider a list of a few of the exotic new foods brought by the Arabs to Italy in the Middle Ages: sugar, citrus, rice and durum wheat – a revelation to the peninsula as it could be stored better than finer wheats and, of course, it then became one of the most important ingredients in the country for making pasta, itself anArabic influence, contrary to popular belief. Other food preserving techniques that Root credits the Arabs for introducing to Italy include sorbets, dried and candied fruit, flaky, golden pastry and the techniques of dry curing meat and distillation. It is hard to imagine Italy without pasta, gelato, prosciutto and grappa, but even harder to imagine Sicily without its lemon granita, sticky zibbibo wine, love of sweet, candied-fruit-laden or marzipan-filled desserts or floral essences like orange blossom water to perfume almond milk puddings, for example – all hints of the region’s Arabic past. Sicily has an especially close link to Arabic culture as it was, for about two hundred years between the ninth and eleventh centuries, an Arabic island. It really comes as no surprise when you look closely at Sicilian cuisine – so unique amongst the vast regional culinary traditions of the rest of the peninsula – that Sicily was the most transformed by this culture. They still have a way of using fruit, spices and nuts in dishes that you don’t see in the rest of Europe. During its time as an Arabic island, this “garden paradise”, as it was known, flourished thanks to the agricultural efforts that were established by its owners: Citrus, zibbibo or muscat grapes (which, by the way, were planted in a terrace system invented by the Arabs too), dates, melons, pistachio, almonds and spices such as cumin and saffron pervaded the island’s landscape, its cuisine and its language. How I love the connection between language and food. Consider, for example, these Italian words followed by their Arabic origins – sugar, zucchero, sukkar; saffron, zafferano, zafaran; muscat, zibbibo, zibib. 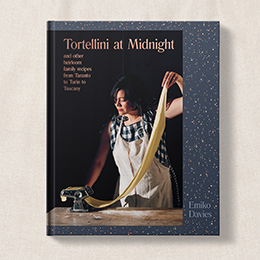 Considering the immense culinary patrimony that was passed on to southern Italy that, over centuries, has danced and mingled and developed into Italian cuisine as we know it today, I find Arabic cooking fascinating and any chance to learn more of it and bring it into my kitchen is a welcome one. 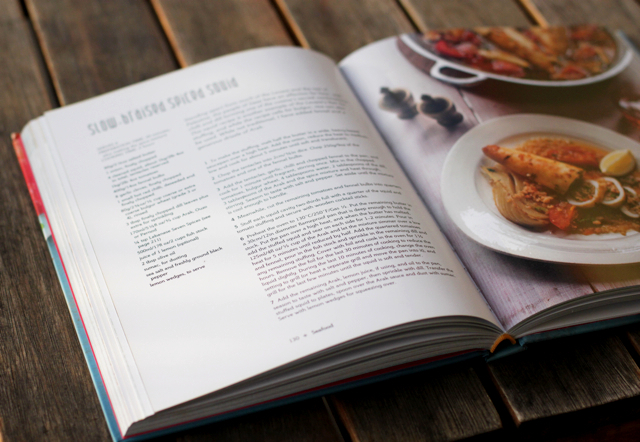 So it was with great curiosity and excitement that I dove into The Jewelled Kitchen, the new cookbook of the multi-talented Bethany Kehdy (the beauty behind Dirty Kitchen Secrets and the mastermind behind London’s Food Blogger Connect) for its virtual book launch. 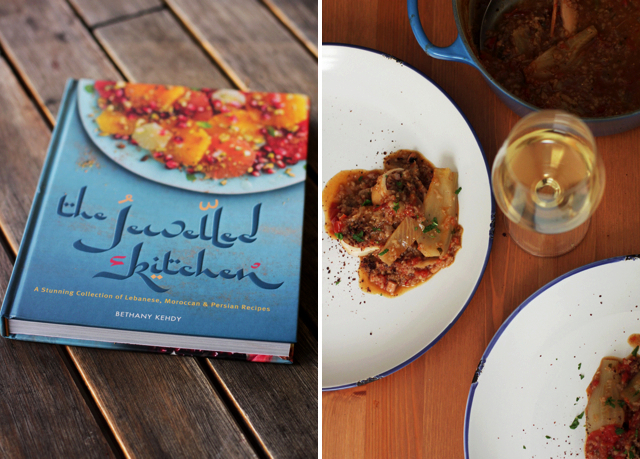 The Jewelled Kitchen is a labour of love featuring Kehdy’s favourite traditional Levantine recipes – Lebanese, Moroccan and Persian dishes with classics like fattoush salad, tabbouleh or lamb flatbread pizza and gorgeous, tempting desserts such as wild orchid ice cream. 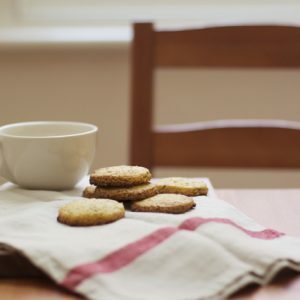 It’s all shot beautifully by the lovely Sarka Babicka, also known for her blog Cook Your Dream. Although I tend to go weak at the knees for Arabic desserts, when I saw the recipe for slow-braised stuffed squid, I couldn’t resist. It’s so similar to one of my favourite dishes that we often make at home and I had to try it out to compare; to trace the similarities and the differences and imagine the voyage and handing over of this recipe from one culture to another. Seppie or calamari ripieni (stuffed cuttlefish or squid) is a dish that both Sicily and Puglia lay claim to in almost identical traditional recipes – the squid is usually stuffed with a mixture of stale bread, anchovies, olives, capers, its own legs and grated local cheese. 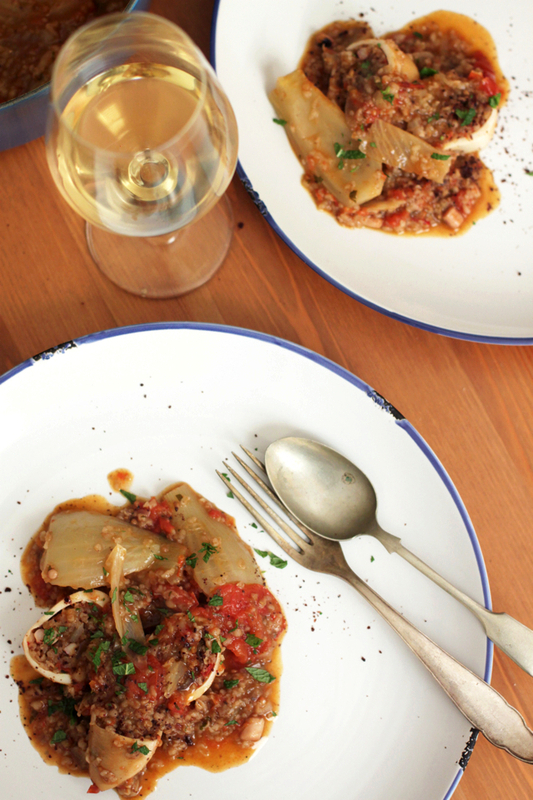 The Silver Spoon has a similar recipe with a filling of prosciutto, bread, garlic and parsley, with the stuffed squid then cooked in a tomato sauce. The Italian recipes tend to cook these quite quickly, on the stove top, rather than braising in the oven for hours. I quite like it with farro replacing the bread, so I was intrigued when I saw Bethany’s version featured a stuffing of bulgur, or cracked wheat. The filling is like a meal in itself with fresh tomatoes, fennel, onions, garlic and chilli mingling with the bulgur, Lebanese Seven Spices* and a splash of Arak, an aniseed-flavoured liqueur and an untraditional addition of Bethany’s. The warming spices add a fragrant element to the dish that make it unmistakably Middle Eastern – if you were to take them out and replace the bulgur with bread, this could easily be taken for a southern Italian dish. Make the stuffing by sauteing the onion in half the butter for about 5 minutes or until soft and translucent. Add the tentacles, chopped, garlic, chilli, half of the fennel, chopped and cook for a minute, then add 250 gr of the tomatoes, chopped, bulgur, 4 tablespoons of water, 2 tablespoons of dill, 3 tablespoons of Arak and the spices and heat through. Season to taste and set aside until cool enough to handle. Stuff each squid 2/3 full with this mixture and secure with a toothpick. Preheat oven to 130 C. Place the rest of the butter in an ovenproof, flameproof dish (like a casserole pot) on high heat over the stovetop. Sear the squid on all sides for 1-2 minutes. Add 125 ml of Arak and simmer 5 minutes. Quarter the rest of the tomatoes and fennel and add to the pot along with the fish stock, dill and any remaining stuffing mixture. Cover and transfer to the oven, cooking for 1 1/2 hours. Remove cover for last 30 minutes of cooking to reduce the liquid slightly. For last 10 minutes of cooking use the grill setting. Just before serving, add remaining Arak, lemon juice, olive oil and season with salt and pepper. Transfer to plates, dust with sumac and serve with lemon wedges. This looks delicious, we were fortunate to taste some things from the book at the book launch over the weekend. I can still remember the squid that Marco made for us in Cecina, I bet this one is delicious as well. Wish I could buy squid here, we just have the rings and they taste like rubber! Love how you connected Italian food history with Arab food history. When I was little, my Mum used to make a squid stew with fennel and I’d complain bitterly about how much I hated it. Now I’m all grown up I adore squid in any form – quickly BBQ’d or pan fried, braised or stuffed. 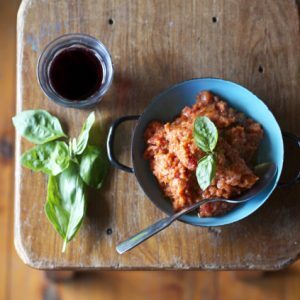 This slow cooked recipe is a one pot wonder I’m just itching to try – gorgeous. Isn’t it funny how we come round to certain foods as adults? 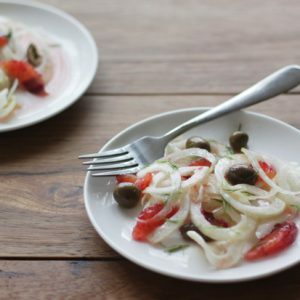 I adore squid too – so easy to eat, whether simple or elaborate and really quite versatile. Stuffed like this, I have to say, is one of my favourites! Absolutely loved your post Emiko – I am utterly fascinated by the origins of dishes and how culinary traditions have spread across the world, sometimes preserved as they were but more often that not morphing into something new entirely together with local traditions. My parents lived in Morocco before I was born so I grew up eating a lot of Middle Eastern / Levantine dishes and yes, Arabic desserts make me weak at my knees too! Thanks Sophia – oh, I have a real soft spot for Morocco, I went there for my honeymoon so have lots of gorgeous memories, especially food memories, we did an amazing cooking class in Marrakech and ate so well while we were there, some of the best food I’ve eaten anywhere! One of the memorable restaurants we visited in Essaouira was run by a young Moroccan guy who used to live in Milan so the dishes were a wonderful mixture of Italian and Moroccan styles and flavours (things like chicken tagine with gorgonzola and pear). It was stunning. And amazing how well the two quite different cuisines could sit side by side together! 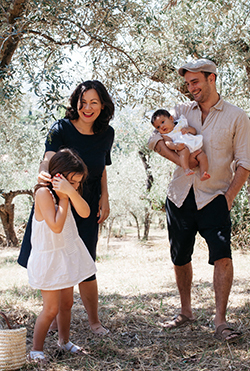 Your blog has become regular reading for me, Emiko – thanks for making Sicily next on my list of places to visit. I love those regions on the borders of different cultures, where all those traditions and flavors can meet and mingle. Shaanxi cuisine is my new favorite mini-trend – it’s the same way, between East and West. So good. Thanks, Nicole, such an honour as I love your blog! I’m constantly fascinated by these wonderful combinations of different cultures too – China is amazing for this! I lived in Beijing for 8 years growing up and there was a Uyghur community there from Xinjiang province with the most amazing food, a mix of Muslim/Chinese – another good one!